At great cost and expense, a major mystery has been solved. Since Thirties men’s fashion is not a subject I have studied well, I thought the singers were referring to something particularly arcane: a “T-clasp pearl,” which suggested a jeweled tie clasp. I only found out that what they were singing was “Técla pearl” when I bought the sheet music for the song at an antique store about a year ago. Trying to find out what kind of pearl a Téecla pearl was . . . . I must not have had my websurfer’s hat (the one with the light on) fastened correctly. So I despaired. I thought it would be another unsolved mystery. But then a friend recommended that I secure the services of Sir Damien Sitzfleisch, the world’s most successful tracer of the obscure. We haggled over price, but one we had agreed, results were immediately forthcoming. Hence and forthwith. 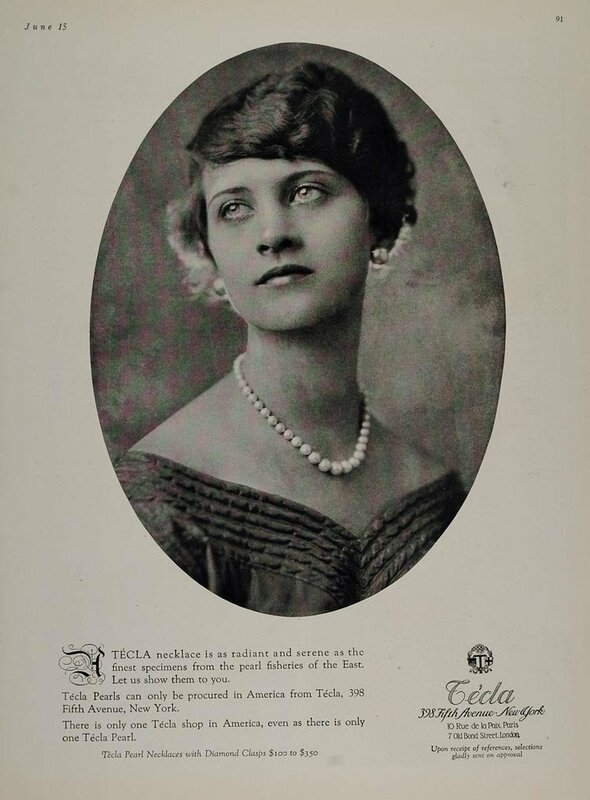 And (circa 1923) there was only one Técla shop in America, so the wearer of such a pearl was someone of means who knew (and wore) the best. I’m also fascinated with the lyric as an early example of product placement, or perhaps giving a company a free advertisement . . . and that something so well-known in 1935 has become completely obscure today. 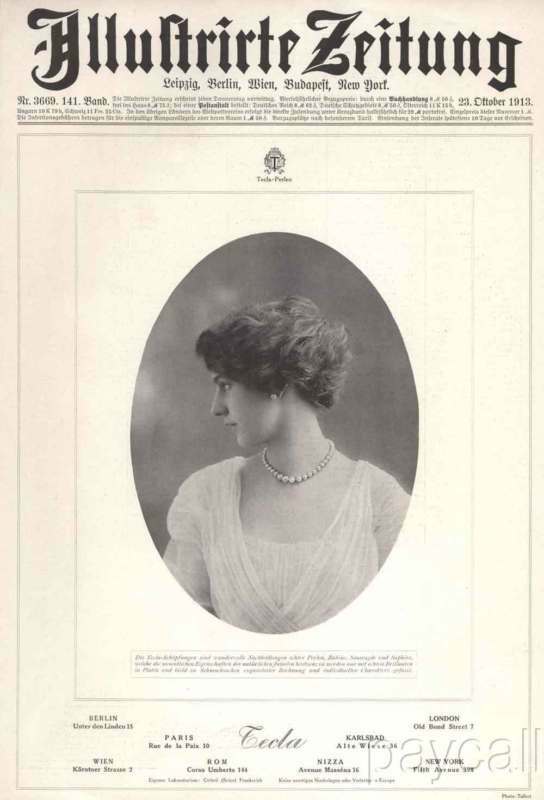 With or without the accent over the first E (the sheet music lacks the accent, I believe). And here — as a special treat — is the May 2012 version of this song (in G, no less) by John Reynolds, guitar and vocal; Marc Caparone, cornet; Ralf Reynolds, washboard; Clint Baker, trombone; Katie Cavera, string bass. John knows about a Técla pearl, because I shared the results of my preliminary research with him . . . but he hasn’t seen the advertisements! Not only is the mystery solved, but we get to hear John sing (twice), Marc and Clint, Ralf and Katie rock it for all time . . . ! You won’t find me wearing a string of Técla pearls at the next jazz party, but that’s only because they make my complexion look sallow. P.S. 398 Fifth Avenue, once the home of Técla pearls, now is the home of a rug company. Nothing against rugs, mind you, but sic transit gloria mundi. More from Dixieland Monterey 2011 (the Jazz Bash by the Bay)! On paper, this was advertised as simply another session by the Reynolds Brothers, which was good enough for me: I had been following them around, a dazed and grinning hero-worshipper. They’re John (National steel guitar, vocals, whistling), Ralf (washboard), Katie Cavera (string bass, vocal), Marc Caparone (cornet). More than enough for anyone! But when I saw their friends — Jeff Barnhart (piano), Dan Barrett (trombone), Bryan Shaw (trumpet), I settled into my seat knowing that great things — a jazz colloquy on Olympus — would come. I adjusted my camera’s white balance so the scene looked less like a Vincent Price film in time for the second number, I WANT A LITTLE GIRL. Originally recorded in 1930 by McKinney’s Cotton Pickers (with a vocal by George Thomas, if I remember correctly), it was rediscovered in 1945-6 by Buck Clayton and Louis. Because I had made dinner plans with the irrepressible Jack Rothstein, I had to leave at this point, but I turned to my dear friend Rae Ann Berry and begged her in an insistent whisper, “Please. Please tape the rest of this? I have to go but I can’t stand missing the rest.” And Rae Ann, truly a good sport, took over. So the remaining videos exist because of her generosity. This music gave and gives so much pleasure that I had trouble finding a title for this posting. I am content with mine — see the smiles on the faces of the musicians! — but have to share another story, with apologies for the dropping of names. When I was fortunate enough to chat with clarinetist Frank Chace (now more than a decade ago), he remembered that he and Marty Grosz had listened, rapt, to Pee Wee Russell’s solo on SWEET SUE with the Muggsy Spanier Ragtimers. Marty’s comment was, “Well, if that doesn’t scrape the clouds . . . !” which is as good a summation of what artistic bliss feels like. Thank you, Jeff, Dan, Marc, Ralf, Bryan, Katie, John, and Rae Ann — for keeping Beautiful Music Alive! Up until a few weeks ago, I would have sworn that the entire output of the Spirits of Rhythm — that gloriously hot (and sometimes silly) group — could have been contained on one CD of their 1933-41 recordings, including sessions with Ella Logan and Red McKenzie. Of course, there were other extras — Leo Watson’s one session for Decca, a later one for Signature (with Vic Dickenson), and a mid-Forties reunion of the group on the West Coast which resulted in four sides for the Black and White label. Tangentially, Leo Watson appeared on a few Jubilee shows and once on a Rudy Vallee radio program, as well as recording with Gene Krupa and Artie Shaw, but I thought the musical material was unbearably finite. That was until I found “TOM TOM, THE ELEVATOR BOY” on YouTube and got to see the Spirits in action (the clip came from the otherwise-forgotten 1941 musical SWEETHEART OF THE CAMPUS). And some more online research has just turned up that they appeared in two other films that year: ALABAMY BOUND and YES, INDEED! Both musicals were directed by Dudley Murphy, the second with Josef Byrne (it seems to be a short subject with Dorothy Dandridge). Something tells me that these weren’t big-budget mass-market productions, but perhaps productions aimed at the Black market, done in a hurry and on a minimal budget. In fact, I have no assurance that the three films have different musical numbers. And in 1942, the Spirits appeared in PANAMA HATTIE. But did you know that the 6 Spirits of Rhythm (including Teddy Bunn, Wilbur and Douglas Daniels, Leo Watson, Virgil Scoggins, and Ernest “Serious” Myers) appeared on Broadway from September 1935 to March 1936 — alongside Bea Lillie, Eleanor Powell, Ethel Waters, and Eddie Foy, Jr. in the Dietz-Schwartz musical AT HOME ABROAD? Do I have any Broadway archivists among my readers? At the top of the page is a still of Leo Watson from ALABAMY BOUND. The world needs more film footage of Leo and Teddy Bunn. Or, if you think that statement’s too sweeping, I do.